Chickungunya is a mosquito-borne viral infection carried by the Aedes Mosquito. These mosquitos are most active during the daytime hours and around dawn and dusk. When an Aedes mosquito feeds on the blood of a person infected with chikungunya, the virus is transmitted to the mosquito. Within 8 to 10 days the mosquito can then transmit the virus to another person and is able to do this for the rest of its life. Infection cannot be spread directly from one person to another. These mosquitoes can find indoor breeding sites, including flower vases and water storage tanks in bathrooms, as well as outdoor buckets containers and plant pots. 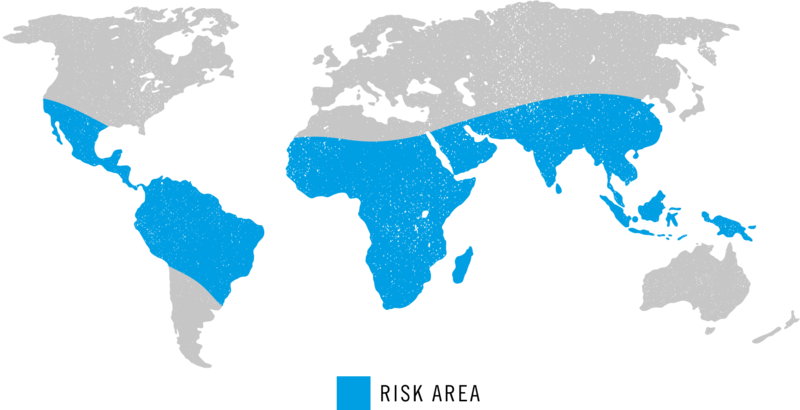 Chikungunya is endemic in Africa, Southeast Asia, the Indian subcontinent, Saudi Arabia and the Philippines. A recent outbreak in the Caribbean and the spread of the virus through central and South America is causing concern. Nearly 200 cases of Chikungunya infection in UK travellers were reported in November 2014 by Public Health England. 80% of these cases were acquired in travellers who had visited the Caribbean, South and Central America. According to WHO, as of January 2015, over 1,135,000 suspected cases of Chikungunya have been recorded in the Caribbean islands, Latin American countries and the USA. Symptoms can present between 4-8 days after infection. Typical symptoms begin with rapid onset of severe joint pains of the back and knees. Other symptoms include high fever, headache, nausea, fatigue, muscle pain and skin rash. Infection is very rarely fatal. Most people make a full recovery, but joint pain may persist for several months or years. A person who has recovered from chikungunya infection is likely to have lifelong immunity against repeated infection. If chikunguya infection is suspected, medical advice should be sought. Treatment is supportive only with anti inflammatory drugs and pain killers such as paracetamol. It is important that Aspirin is avoided as this may cause bleeding. Travellers returning home with symptoms such as fever and joint pain should seek medical advice as soon as possible. There is no vaccine or drug to prevent chikungunya infection. Mosquito bite prevention is the only way to prevent and reduce the risk of infection. • Use mosquito nets and plug-in room vaporisers. • Use a clothing treatment such a EX4 Anti Mosquito for Frabrics to kill mosquitoes that land on clothing. Apply to clothing being worn in high risk areas and areas of outbreak.